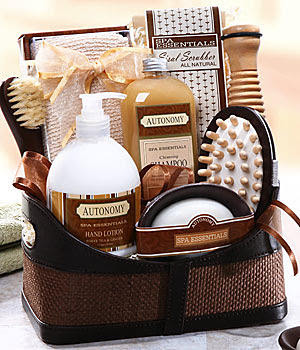 The Sweet Vanilla Elegance Spa Basket I received comes with lots of goodies to make bath time so much more relaxing and pleasurable. As some of you might know already, I loooove anything vanilla so you can imagine how thrilled I was to try them out. 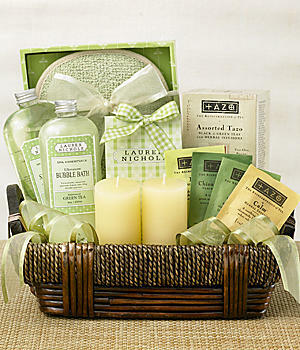 The basket includes a Vanilla Orchid Body Lotion, Bubble Bath, and Bath Tea which smells like vanilla but with a much sweeter, flowery note. The lotion smelled amazing and was super moisturizing! It left my skin baby soft--loved it! It also includes a Thumb Massager, Bath Mitt, and Leaf Fizzler. Not only was it beautifully wrapped but it comes in a gorgeous leather basket that can be used as storage after. ProFlowers gets an A+ for selections, price, and delivery in my book! I would absolutely recommend them. Go to www.proflowers.com for more pricing and selections. Oh, very nice! Good for you, you deserve it. I didn't realize they did spa baskets and will have to check them out! Thanks. Yes, they do! A bunch to choose from too.